We have just had a lovely little break in the Lake District near Kirkby Lonsdale and whilst away, went for supper in a smashing pub called the Lunesdale Arms. Whilst in there, I had a little wander around the place, as you do, and came across these brilliant wall mounts in the billiard room! There was also a fabulous elephant head (above my budget) and a stag head (again a bit too much for me) so, I opted for these guys. 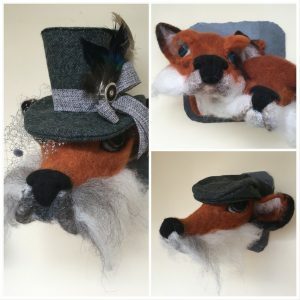 Lord and Lady Fox-Mount and their offspring! Come along to The Steppes B&B and meet them and/or place orders for your own dogs, cats, reindeer, etc., to be mounted on your own wall at home!! We’ve been busy while you’ve been away!! 9.6 out of 10! Thank you!